Boy, it sure does feel like Summer... am I right?! I know it doesn't officially begin until the 21st, but PHEW! it's hot outside. Every time I go out the door to take Heidi into the yard I'm instantly drawn back in by the humidity, thanks to the rainy Spring we're having here is southwest, Virginia. But nevertheless, I'm determined to enjoy summertime as I'm pretty sure I prayed for it 1,000 times during our very, very cold winter. I'll take the heat over snow and ice any day! Ever since we moved back to Virginia from California last year the difference in climate has taken a toll on my skin. I've been trying and testing lots of new products, one of which has been my deodorant. 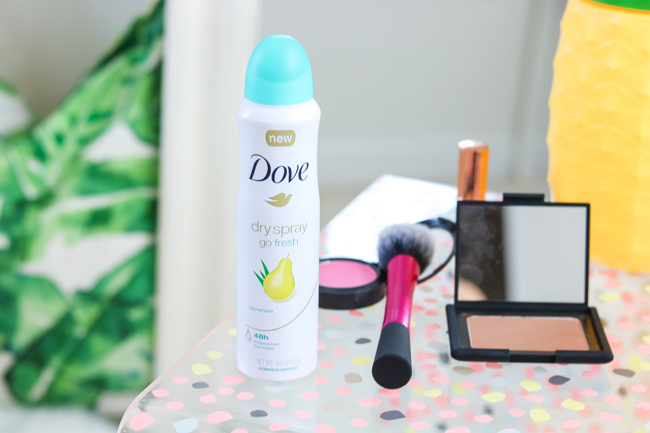 And if you've been following me long, you know I've been using Dove's Advanced Care Dry Spray for months now. And last week while shopping at Target I picked up their newest addition, Fresh Pear & Aloe Vera Antiperspirant... Oh, Em, Gee, delicious! Y'all know how I feel about Target - OH, how I love Target. I know everyone says it but it's so true... go in for toothpaste and come out with 10 new outfits, 15 beauty products, an overhaul of decorations for your house, a bin full of items from the $1 section, three new coffee mugs... oh yeah, and no toothpaste haha! Luckily for me, I actually remembered what I went in for last week - a rare occasion. 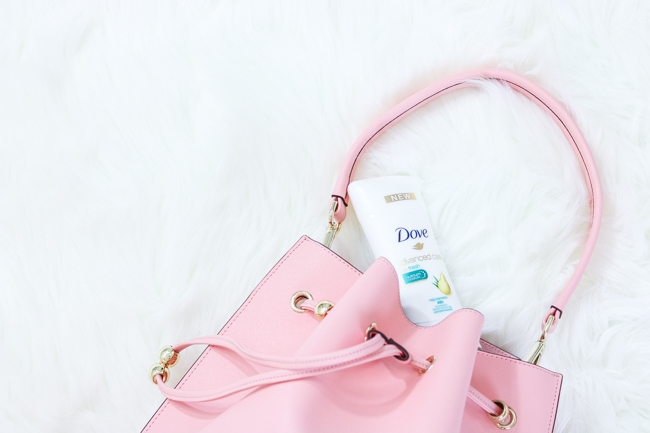 One of the things I love most about Dove's Advanced Care Go Fresh Pear & Aloe Vera Antiperspirant (I own the dry spray and the solid) is that I never find myself worrying about uncomfortable odors or wetness from sweat. When I first tried the dry spray I was skeptical that it would actually work, but it totally does - and now I own three bottles! It's so easy to use and I find myself taking it with me for quick touch ups after barre class if I have errands to run, or if I'm meeting J after to eat. The funny thing is, touch-ups aren't even necessary as you'll get 48 hours of protection... I just always like to make sure lol... and honestly I just love the smell! 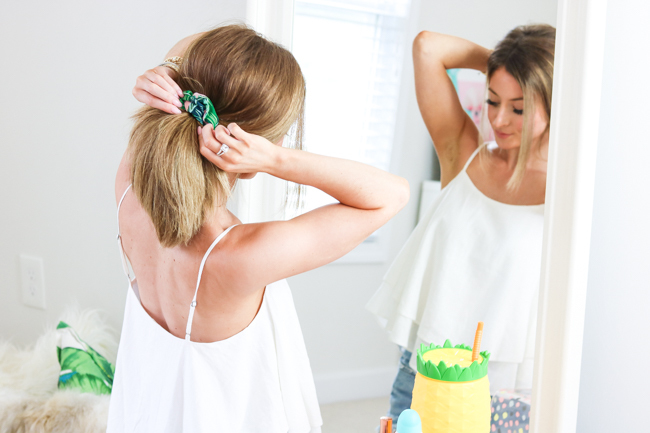 The newest version of pear & aloe vera seriously smells like summer. And with this miserable heat, there's nothing better than an antiperspirant that keeps you dry through warm weather activities like beach vacations, long days at the pool, and your usual work out. It's dermatologically tested (which I'm all about these days), contains 1/4 moisturizers, and is alcohol (ethanol) free. I like it so much I also bought the solid version because some days that's just my preference. Does anyone else ever get sidetracked and actually forget their deodorant?! I'm not ashamed to say I do this often - hence why I've started packing my Dove deo when traveling or heading out of the house for the day. J and I are such homebodies that we hardly ever go anywhere. We aren't the biggest outdoorsman and thanks to my acquisition of every pollen allergy know to man, I sometimes have to enjoy myself indoors - like sipping out of a super cute pineapple water bottle while getting ready next to my palm print pillow lol. And don't feel bad for me/us, we LOVE our hermit ways, but lately, we've been talking about pushing ourselves to actually get out of the house. We've been planning some trips for a while now so I've made a Summer Bucket List with a few, in addition to things I'd like to personally accomplish or check off my list this Summer/early Fall. Some of them are sort of silly, but bucket lists are supposed to be fun right?! 2 // Make it to the race track with J - if you didn't know, he loves circuit racing! 6 // Visit Disneyworld + Harry Potter World - we went to HP World last year... so much fun! 10 // And finally... decorate our outdoor patio - we even have an outdoor fan so it's perfect! I'd love to hear your bucket lists and fun vaca plans. Feel free to leave me a comment below! 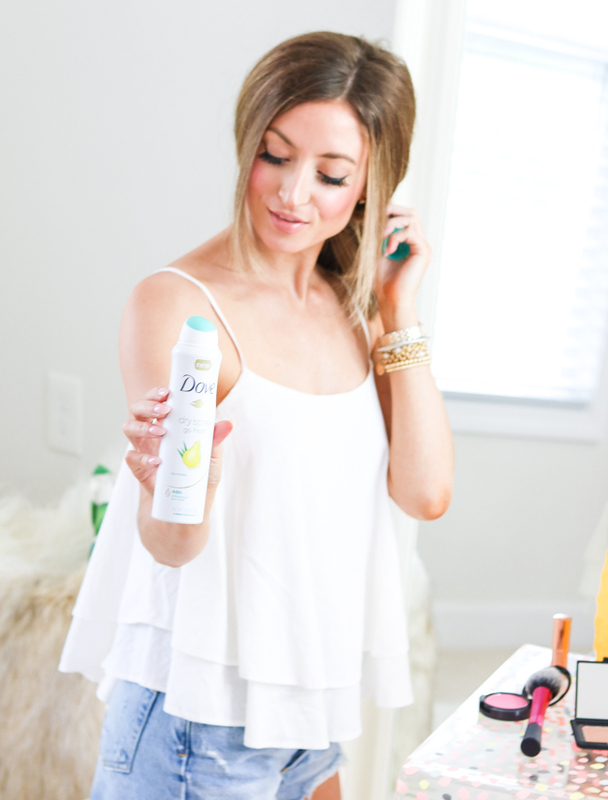 If you're interested in trying Dove's dry spray or solid Go Fresh Pear & Aloe Vera Antiperspirant for yourself, Target is offering 10% off via cartwheel until June 23rd, and if you buy 4 Dove products you'll get a $5 Target gift card (from June 24th - June 30th). Now you have a good reason to go to Target hehe - you're welcome!